If you're wondering how to make shrimp cocktail, rest assured that it's one of the easiest gourmet seafood dishes you can make. This tasty ocean appetizer looks impressive with only a little bit of effort, and it's sure to please your dinner guests - if you don't eat it all before they arrive! First things first - you want to use fresh shrimp for this dish. Since you'll be serving the shrimp cold, their flavor (or lack thereof) will be the first thing you notice. 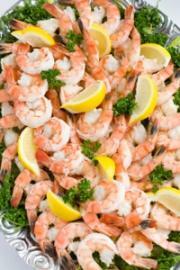 If you're unsure how to prepare shrimp, you can get high quality pre-cooked shrimp from your local butcher. Be sure to taste one before you buy, since mealy shrimp will definitely ruin the texture of your dish. Cocktail sauce is easy to make and can be finished in less than five minutes. Make this ahead of time so that all you have to do when you want shrimp cocktail is cook up your shrimp. Combine all ingredients and blend well, getting rid of any lumps. Serve with cold, cooked shrimp. If you don't know how to cook shrimp, here's a sure-fire way to have them turn out perfectly. Shrimp is actually very easy to cook, with the primary concern being that you don't want to overcook them, even for a minute. 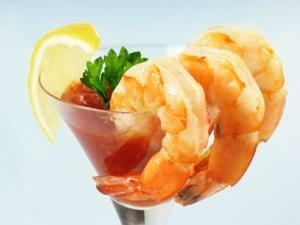 The texture of shrimp is very delicate, and overcooking will cause them to go from light and fluffy to tough and chewy. Here's a tip: make sure to keep an eye on your pot once you add them to the water - don't walk away, for even a few seconds! For a large party, serve on a platter. First, set up your workstation. Set a large bowl of ice water (large enough to hold the water and the shrimp) on the counter next to where you will be boiling your pot of water. In a large pot of water, stir in seasoned salt, lemon, garlic, shallot, cayenne and pepper. Bring to a boil. Add your shrimp to the boiling water, cooking them just until they turn bright pink. Do not overcook them! You'll end up with shrimp the texture of pencil erasers. Drain shrimp right away and pour shrimp into the ice water for two minutes. Again drain shrimp and peel off their shells, leaving the tail in tact. Dry shrimp with paper towels, and serve with cocktail sauce. For an amazing variation on your regular shrimp cocktail, try this Mexican recipe. Avocados add something special to this dish, and your guests will love it. In a small bowl, make a coarse paste of garlic, cilantro, horseradish, lime juice and sea salt. In a large bowl, mix together avocado, tomato juice, ketchup and hot sauce. Pour garlic paste mixture into avocado mixture, stirring until well incorporated. If you like, you can throw the whole shebang in the blender for a very smooth sauce. Serve with cooked, cold shrimp.